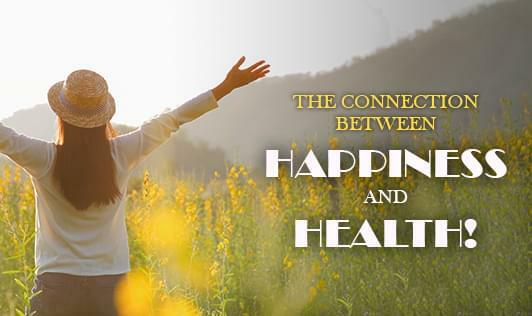 The connection between Happiness and Health! Happiness and health have been anecdotally linked for quite a while now—"laughter is the best medicine" has become a cliche' for a reason—but research backs up what many people have instinctively assumed all along: that happiness and health really are connected, and that one's level of happiness really can impact the level of one's health. Love and happiness may not actually originate in the heart, but they are good for it. A 2005 paper found that happiness predicts lower heart rate and blood pressure. In the study, participants rated their happiness over 30 times in one day and then again three years later. The initially happiest participants had a lower heart rate on follow-up (about six beats slower per minute), and the happiest participants during the follow-up had better blood pressure. Do you know a grumpy person who always seems to be getting sick? That may be no coincidence: Research is now finding a link between happiness and a stronger immune system. In a 2003 experiment, 350 adults volunteered to get exposed to the common cold (don’t worry, they were well-compensated). Before exposure, researchers called them six times in two weeks and asked how much they had experienced nine positive emotions—such as feeling energetic, pleased, and calm—that day. After five days in quarantine, the participants with the most positive emotions were less likely to have developed a cold. Stress is not only upsetting on a psychological level but also triggers biological changes in our hormones and blood pressure. Happiness seems to temper these effects, or at least help us recover more quickly. In the study mentioned above, where participants rated their happiness more than 30 times in a day, researchers also found associations between happiness and stress. The happiest participants had 23 percent lower levels of the stress hormone cortisol than the least happy, and another indicator of stress—the level of a blood-clotting protein that increases after stress—was 12 times lower. A 2001 study asked participants to rate their recent experience of positive emotions, then (five weeks later) how much they had experienced negative symptoms like a muscle strain, dizziness, and heartburn since the study began. People who reported the highest levels of positive emotion at the beginning actually became healthier over the course of the study and ended up healthier than their unhappy counterparts. Happiness is associated with improvements in more severe, long-term conditions as well, not just shorter-term aches and pains. In a 2008 study of nearly 10,000 participants who reported being happy and satisfied with life most or all of the time were about 1.5 times less likely to have long-term health conditions (like chronic pain and serious vision problems) two years later. The ultimate health indicator might be longevity. In perhaps the most famous study of happiness and longevity, the life expectancy of Catholic nuns was linked to the amount of positive emotion they expressed in an autobiographical essay they wrote upon entering their convent decades earlier, typically in their 20s. Researchers combed through these writing samples for expressions of feelings like amusement, contentment, gratitude, and love. In the end, the happiest-seeming nuns lived a whopping 7-10 years longer than the least happy.